If someone had told me about three to four years ago about a fictional story featuring a historical leader and his encounters with the supernatural . . . I would have laughed in that person’s face. Hell, I would have done that about a year later. Then Seth Grahame-Smith wrote a novel about Abraham Lincoln battling vampires. And you know what? I did not laugh. But I sure as hell did not take it seriously. Last spring, I saw the trailer for the movie adaptation of Grahame-Smith’s novel and found myself surprisingly intrigued by it. Well . . . I was intrigued by the movie’s visual style. And the fact that movie featured actors that I have become a fan of did not hurt. But the idea of Abraham Lincoln being a vampire hunter remained a block in my mind. In fact, I struggled over whether or not to see“ABRAHAM LINCOLN: VAMPIRE HUNTER”, until the day before the movie’s wide release. And to my surprise, I am glad that I finally saw it. “ABRAHAM LINCOLN: VAMPIRE SLAYER” begins on April 14, 1865 . . . with President Abraham Lincoln recounting his experiences with vampires in a journal. The movie flashbacks to the year 1818 in Southern Indiana, where the young Abraham and his parents – Thomas and Nancy – work out the family’s debt to a local landowner and slave owner named Jack Barts. Abraham befriends an African-American young slave named William Johnson. When the latter is attacked by one of Barts’ employees with a whip, Abraham intervenes before his father comes to his rescue. Barts demands that the Lincoln family compensate for the interaction over William in cash. Thomas cannot afford to pay back the landowner and refuses to work out his debt even further. Barts later attacks Nancy at the Lincolns’ cabin and poisons her. She later dies the following morning. Nine years later in 1827, an eighteen year-old Abraham seeks revenge against Barts by attacking him. But the latter, who proves to be a vampire, overpowers Abraham. Abraham is rescued by a mysterious man named Henry Sturgess, who informs the young man of Barts’ true state. Henry offers to teach Abraham to be a vampire hunter. During training, Sturgess informs Abraham that Jack Barts and other vampires in America are descended from a vampire named Adam, who owns and lives on a plantation outside of New Orleans, with his sister Vadoma. Sturgess also tells Abraham of the vampires’ weakness – namely silver – and presents the latter with a silver pocket watch. After several years of training, Abraham travels to Springfield, Illinois. There, he makes plans to read for the law, befriends a shopkeeper named Joshua Speed, renews his friendship with William; and falls in love with Mary Todd, a socialite from a wealthy Kentucky family. Abraham also begins his activities as a vampire hunter. “ABRAHAM LINCOLN: VAMPIRE HUNTER” is not perfect. It is a flawed movie. There were one or two aspects of the plot that I found questionable. After Abraham’s reunion with William, the pair was arrested for fighting off slave catchers that were after the latter. Following their arrest, there was a scene that featured the incarcerated pair being visited by Mary Todd. The next scene featured a freed William being kidnapped by Adam’s thugs off the streets of Springfield, in order to lure Abraham into a trap set in Louisiana. How on earth did William avoid being sent back down South as a fugitive slave? When he first reunited with Abraham inside Joshua’s store, he told the latter that he was an escaped slave. So, how did William end up freely walking the streets of Springfield . . . without being sent back South as a fugitive slave? My second problem with “ABRAHAM LINCOLN: VAMPIRE HUNTER” deals with a brief scene during the Civil War. This scene features Confederate president Jefferson Davis convincing Adam to deploy his vampires on the front lines. Look . . . I am the last person who could be accused of being a neo-Confederate. Trust me . . . I am. But I found this scene between Davis and Adam to be very unbelievable, even for fiction. I simply cannot see Jefferson Davis allying himself with a vampire in order to win the Civil War. One, like Abraham, Davis would have been leery of the idea of associating with a vampire. And two, chances are he probably would have become aware of Adam’s plan of transforming the United States in a land of the undead . . . and automatically oppose it. The only way this scene would have worked is if Davis had been unaware of Adam’s state as a vampire. Dear God! What were Varvara Avdyushko and Carlo Poggioli thinking? Abe’s wedding outfit looks like a nineteenth-century version of a high school prom suit, circa 1975. In other words, two periods in time clash in the creation of this God awful suit. It is a good thing that I found their other costumes very impressive. Despite the above flaws, I still managed to enjoy “ABRAHAM LINCOLN: VAMPIRE HUNTER” very much. After watching the movie, I now regret my reluctance over its premise. The idea of historical figure being utilized as an action character in a supernatural story turned out to be very . . . very original. More conservative minds would probably find such an idea sacrilegious. I recall a co-worker expressing disgust at the idea of someone using Abraham Lincoln as an action figure in a movie. But think about it. In some ways, he was a good choice on Seth Grahame-Smith’s part. Lincoln was a physically impressive man, being tall and strong as a bull. He knew how to wield an ax with the same level as a Musketeer with a sword. More importantly, he was an intelligent man who could be ruthless when the occasion called for it. I found Grahame-Smith’s use of Nancy Hanks Lincoln’s death and the issue of slavery to create his story of Lincoln and vampires very effective. The screenwriter used the death of Lincoln’s mother to jump start the future president’s alternate profession as a vampire hunter. 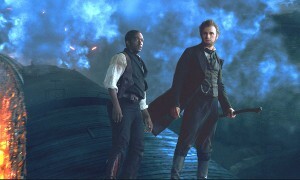 And I was very impressed by his use of the slavery issue to intensify Lincoln’s interest in the destruction of vampires. In “ABRAHAM LINCOLN: VAMPIRE HUNTER”, the institution of slavery and especially the slave trade is used to provide vampires with easily available humans (namely slaves) to feed upon. The Jack Barts character apparently gathered slaves around the Ohio River (which bordered the upper South) and shipped them to the vampire-owned plantations in the Deep South. This strikes me as a fictional reflection of the large-scale shipments of many upper South slaves to the cotton plantations of the Deep South during the first half of the 19th century in real life. According to Abraham’s mentor, Henry Sturgess, the U.S. slave trade not only gave vampires easy access to “food”, but kept their penchant of seeking victims all over the country under control. This use of slaves as easy victims for vampires led to their support of the Confederate cause during the Civil War. The transportation of slaves from the Upper South to the Deep South proved to be one of the movie’s historically accurate contributions to the plot. I have to be frank. “ABRAHAM LINCOLN: VAMPIRE HUNTER” is not exactly historically accurate. In reality, William Johnson was a free-born African-American who became Lincoln’s personal valet. The movie overlooked the fact that Lincoln had a much beloved stepmother, and four sons – not one. Also, Harriet Tubman never operated in the Deep South, let alone in Louisiana. And African slave traders did not sell “their own kind” to Europeans, as the vampire Adam claimed in the movie. They sold people they considered to be strangers and especially, foreigners. But . . . this is a movie about a former U.S. president that became a vampire hunter. Would anyone really expect a tale of this sort to be historically accurate? I certainly would not. But one of the major highlights of “ABRAHAM LINCOLN: VAMPIRE HUNTER” proved to be the mind-boggling visuals created by the special effects team led by Matt Kutcher. These visuals were especially effective in exciting actions sequences that featured Abraham’s final confrontation with Jack Barts on the Illinois prairie, the rescue of William Johnson in Louisiana, the first day of the Battle of Gettysburg and especially the fiery confrontation aboard the train heading for Gettysburg. William Hoy’s editing, Caleb Deschanel’s photography and especially Timur Bekmambetov’s direction really made it happened. Aside from the stomach churning wedding suit, I must admit that I really enjoyed Varvara Avdyushko and Carlo Poggioli’s costume designs – especially for the costumes worn by Mary Elizabeth Winstead. Their costumes, along with François Audouy’s production designs, Beat Frutiger’s art direction and Cheryl Carasik’s set decorations really contributed to the film’s overall look of early to mid-19th century America. And what about the cast? Benjamin Walker, in my opinion, was a find. A genuine find. I do not know how to put this. The man was perfectly cast as Abraham Lincoln. He possessed the height, the looks (thanks to the make-up department). He had great screen chemistry with his co-stars – especially Dominic Cooper, Anthony Mackie, Jimmi Simpson and Mary Elizabeth Winstead. Walker did not simply walk or stand around, looking like Lincoln. Thanks to a superb performance, he made Lincoln a human being, instead of a walking historical figure. Dominic Cooper added another fascinating performance to his résumé as the enigmatic Henry Sturgess, the individual that taught Abraham Lincoln to be a first-rate vampire hunter. His performance reeked with mystery, wit and wisdom. Cooper’s Sturgess was also a curious mixture ambiguity and moral fortitude that I found very fascinating. From what I can gathered, the William Johnson character was not featured in Grahame-Smith’s novel. I could be wrong. I never read the book. But I am glad that the author included the character in the movie, giving me a chance to see Anthony Mackie on the screen again. But this is the first time I truly saw him as a character in an action figure and he was superb. I could also say the same for Jimmi Simpson, whom I have grown used to seeing in comedies. He was great as Abraham’s Springfield crony, Joshua Speed, whose interest in Abraham and William’s old friendship led him to become involved in their vampire hunting activities. Mary Elizabeth Winstead was given the opportunity to portray a different Mary Todd Lincoln from the usual portrayals marred by either insanity or cold-blooded ambition. And in the end, she gave a great performance that conveyed the famous First Lady’s intelligence, vivacity and wit. And Rufus Sewell was first-rate as the movie’s main villain, a long-living vampire named Adam, who harbored plans to make the United States a country fit to be dominated by vampires. Sewell also used a Southern accent that I found surprisingly impressive. As I had stated earlier, “ABRAHAM LINCOLN: VAMPIRE HUNTER” was not a perfect movie. It had a plot hole or two that screenwriter Seth Grahame-Smith had failed to address. The movie’s story also featured an implausible scene featuring a historical figure. But the movie boasted some excellent performances from a cast led by Benjamin Walker and some superb visuals that not only transported moviegoers back to the world of early and mid 19th century America, but also to the supernatural world of vampires. And thanks to Grahame-Smith’s story and Timur Bekmambetov’s stylish direction, the movie began with what many would consider an implausible plot – a historical icon battling supernatural beings – and transformed it into a fascinating tale filled with both fantasy and history. To my surprise, I ended up enjoying “ABRAHAM LINCOLN: VAMPIRE HUNTER” very much.